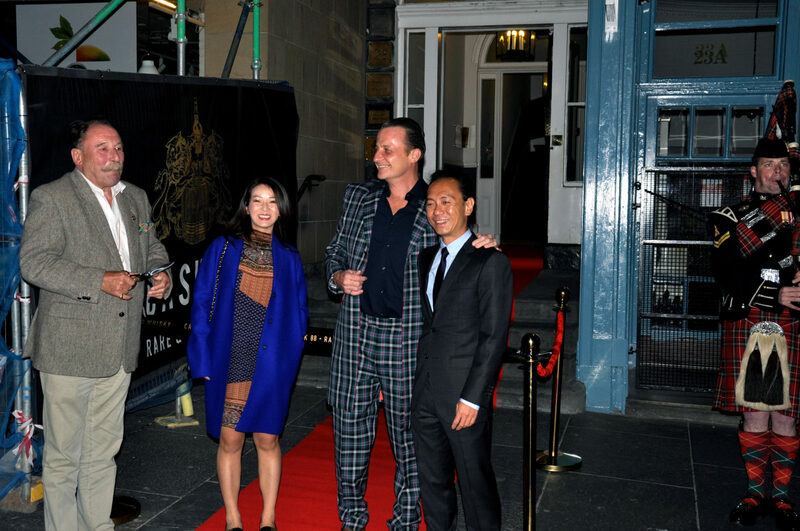 Cask 88 celebrate the opening of their Single Cask Whisky Tasting Room in central Edinburgh, welcoming famous faces in whisky from Scotland and Asia. Daniel Lam, Head of Fine Wine and Whisky at Bonhams Hong Kong, who recently made headlines with his sale of two record-breaking bottles of Macallan, and Scotch whisky writer and consultant Charles MacLean cut the ribbon on Saturday evening at Cask 88’s recently opened Edinburgh office, marking the opening of the dedicated Single Cask Whisky Tasting Room. Also in attendance was Makiyo Masa, founder and director of dekantā, an online retailer offering the world’s largest online selection of authentic Japanese whisky and other spirits. VIP guests and private clients of Cask 88 were guided through a tasting of three single cask whiskies and a showcase of selected independent bottlings from Cask 88. Located within view of the castle and stocked with an extensive gallery of samples from the world’s finest whisky casks, Cask 88’s new Tasting Room will be a private facility allowing clients and special guests to experience whisky from a variety of casks available for sale. Drawing inspiration from classic Scottish design and leisure pursuits, and created under the direction of an acclaimed interior and events designer to the stars, the Cask 88 Single Cask Whisky Tasting Room is designed and equipped to offer a premium whisky tasting experience. Cask 88 expect to welcome clients from across the globe, Asia in particular, seeking to purchase their own casks of Scottish whisky, and enjoy Scottish produce and culture. Experts in cask procurement, specialising in independent bottlings for private clients, Cask 88 have offices to serve clients around the globe from six international locations in Singapore, Japan, China, Vietnam and the Philippines. Between them, the Cask 88 team have decades of experience in whisky tasting masterclasses, offering training, lectures and guided tastings for such esteemed clients as The British Army Headquarters, The Glenlivet, The Peninsula Shanghai, Mandarin Oriental, Grand Hyatt and Marriott Renaissance. If you would like to know more about buying a cask why not download our Cask Buyers Guide 2018 today. This entry was posted in Collector/Enthusiast, Single Cask Distillery. Bookmark the permalink.